Steam page for the game is now up! Game is content complete except for music. Beta testing ongoing. Find more info here! Keep up-to-date on the Facebook page or Twitter for the latest news. I update them more often than making a full big post here. 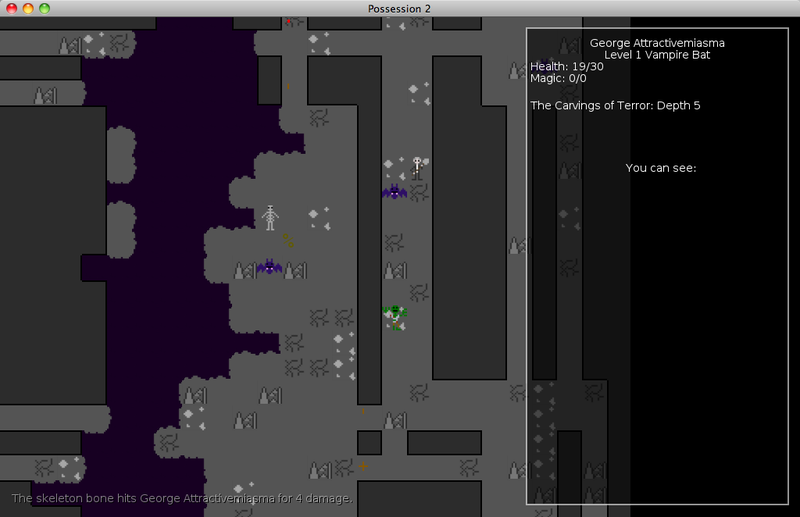 Reading through this thread, you might see the game referred to as "Possession 2," because that's what I was originally calling it, but now it's just Possession. 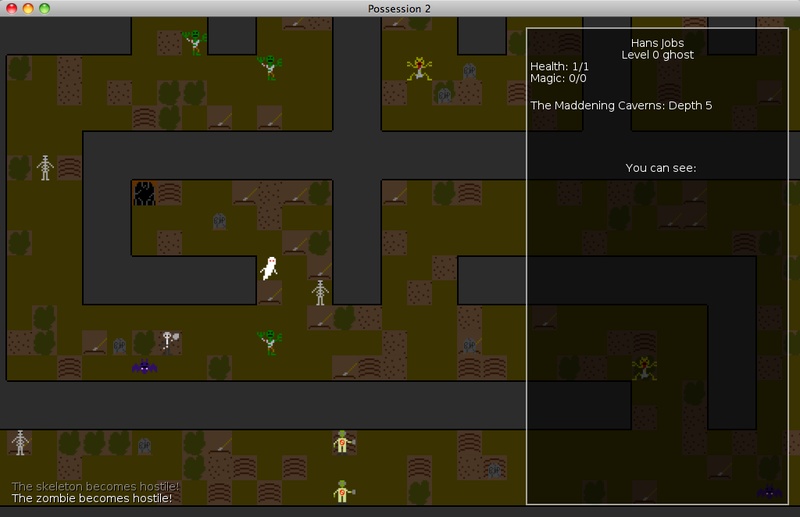 I'm working on a sequel to the 7-Day Roguelike I made this year (well, at the time of posting anyway...after tomorrow it'll be last year) Possession. I've actually been working on it a while, so I've already made some Dev Blog Posts about it, which I'll be summing up in this post. The actual blog posts contain more info, so check that link out if you want to know more. Anyone who played the old game and has suggestions, please feel free to comment, too! (I'll make a post a little later describing some more of the changes I'd like to make). The main thing that it's going to add is more content and variety, but I've also changed the way that possession actually works in the game. In the original, there wasn't much risk to it. You could stay in the same body and keep trying to possess a new one, and there were no consequences to failure. I didn't really like that, since in almost no case is it a better idea to stay in your current body vs. get a new one. So, I changed the way it works. Now, you always leave your body when you try to possess something, even if you fail. Additionally, the ghost will zoom to the new body, and you'll be next to them if you fail! Now, the body you try to possess will be stunned, so you don't have to worry about them insta-killing you, but other monsters nearby will still be active. 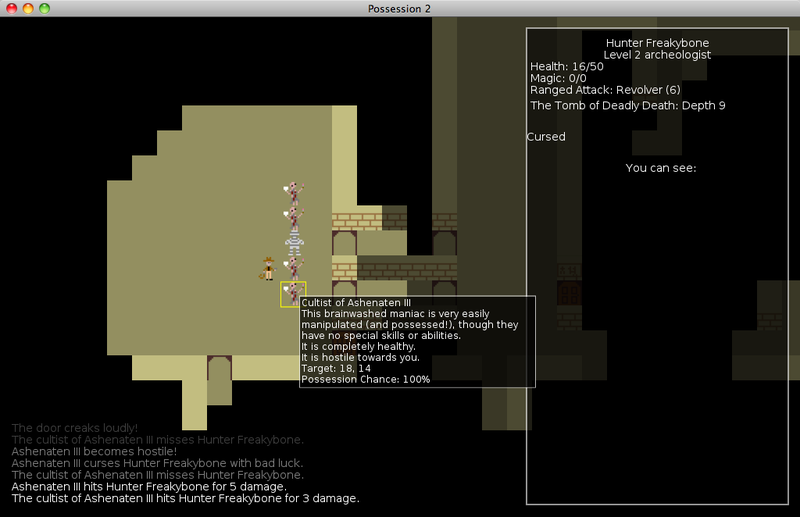 I've also added in projectiles, which are a feature that was sorely missing from the first game. 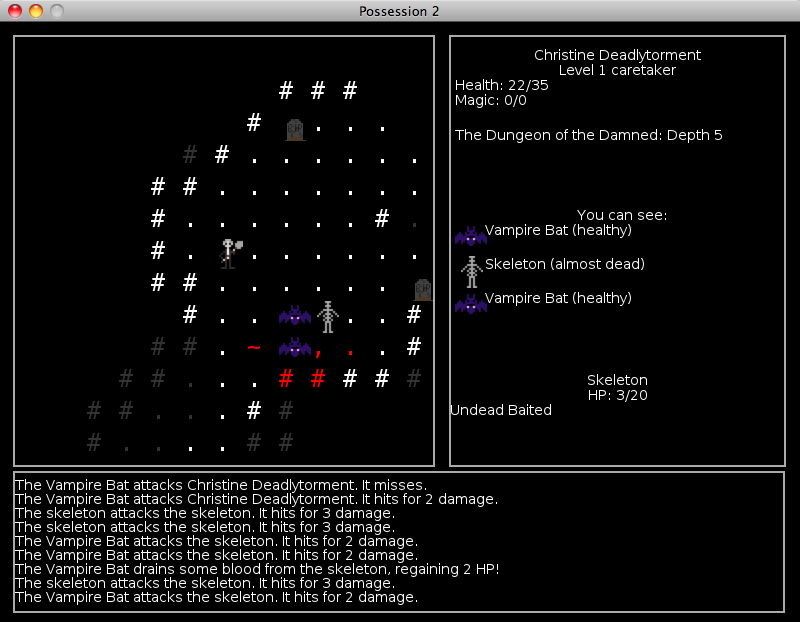 Pictured here, my test case: a skeleton throwing its own bones at people. 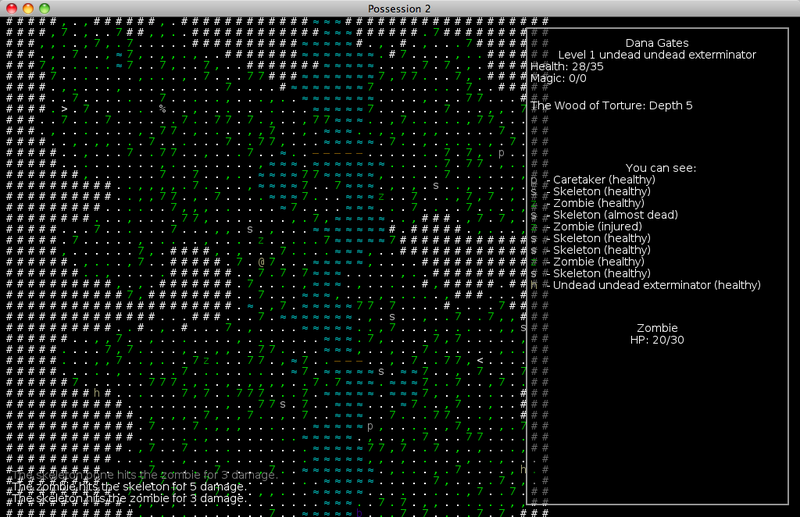 The new game will also feature graphics (though ASCII mode will remain an option). I've supposedly got a friend working on them, but his motivation is a bit lacking, so I've made some pixelly programmer art for the time being just to test out the graphics code. I actually kind of like them. I also introduced the first new creature of the game: the caretaker! He’s found on the first level, and is a sort of stealth-based character. He has some unique abilities that aren’t really like anything in the first game. First of all is Undead Repellant, which keeps undead from noticing you (though they’ll still notice you if you attack them!). The second one is Undead Bait. If you throw it at an empty square, it will make nearby undead congregate around it. But, if you throw it at another creature, it will make all nearby undead attack THEM instead! (Unfortunately, after taking the screenshot I noticed that the creature will also attack ITSELF, so that needs to be fixed). Last edited by Rickton on Sun Jan 06, 2019 2:49 pm, edited 12 times in total. .love file download did not work for me. I always get a 321 byte file. My apologies. I moved my site a little while ago and apparently it screwed up some of the links. All the download links should work now. Yes, download works now. Game works fine too (ran the .love file on Win7 x64), looks promising. Happy New Year! Today I’m going to talk about the levels. 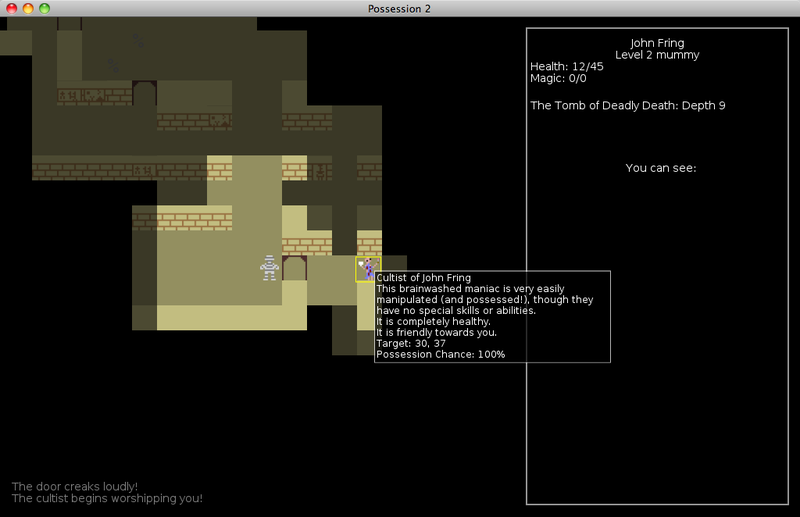 Possession 1 had just one level generator. 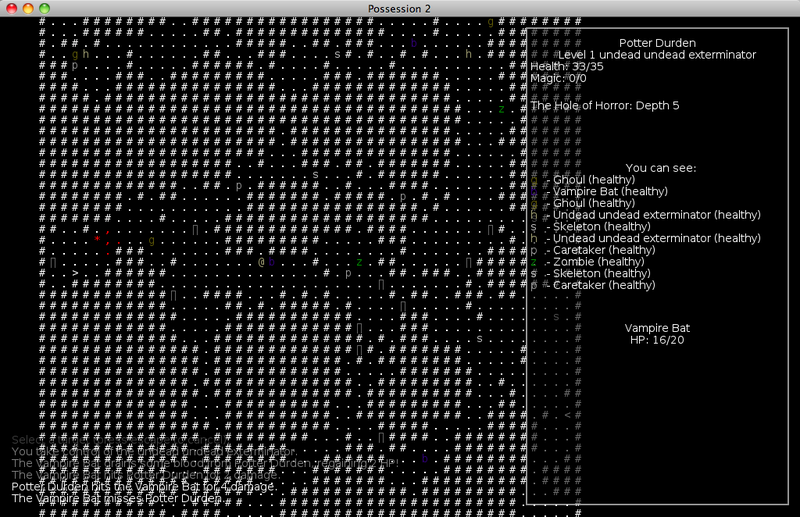 It worked pretty well, and made pretty good-looking caves, but there wasn’t much variation. 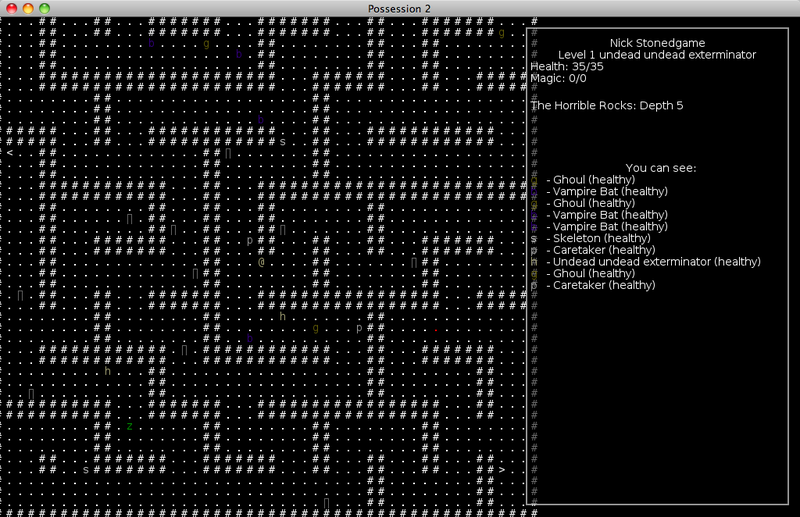 The standard seen in most roguelikes, this generates a bunch of rooms and links them together with corridors. Pretty self-explanatory. 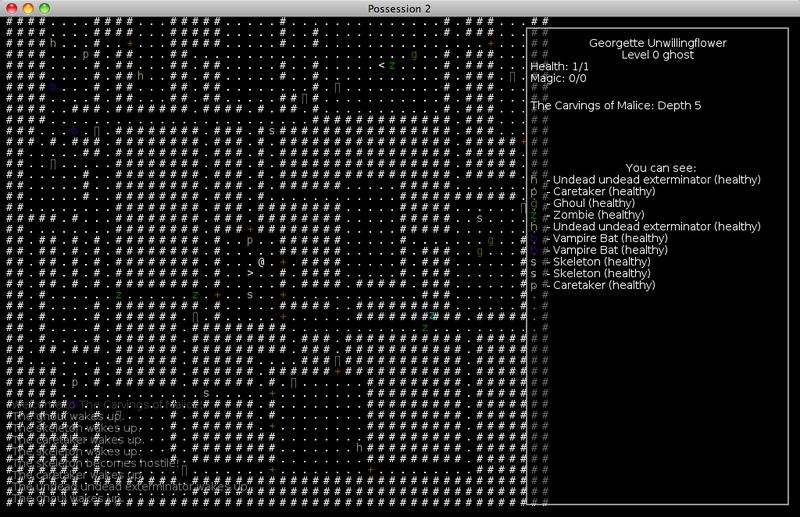 Generates a maze. To make it more interesting, I remove all the dead ends (except two, where I place the entrance and exit), and add some extra passages and rooms. It needs a little more work to ensure that more of the level is open, but this builds random, more natural-looking tunnels across the level. I’ve also written the graphics code for tiles in the levels themselves. There are seperate tiles for walls depending on what other walls they connect to, and various floor tiles to make the level look more varied. You can also see a chasm on the left. Chasms can be crossed by flying creatures, but not by others, and you can knock your enemies into chasms if you have abilities that let you push them around! At some point I'd like to clean up the dungeon generation code and post it up in a form with lots of nice comments and explanation that also isn't as heavily tied into the code in the rest of the game, but here's the code for the generators for the time being if you'd like to try and make sense of it. For the "BSP Tree" in particular, I used this article as a starting point (no code, but it covers the theory of how it works). Germanunkol wrote: This looks really nice. Not only will Possession 2 feature greater variety in its regular levels, but there will also be several "special levels" which you will sometimes visit instead of a regular level. The special levels are themed, featuring special tiles and design, and creatures that fit the theme. More interestingly, they usually feature special tiles, features, effects or layouts. The Tombs are the first special level I've made. They're a series of rooms connected by corridors. Inside, you might be lucky(?) enough to find mummified kings sleeping amongst massive piles of treasure! Being a ghost, you don't really have much use for gold. But the mummies don't know that, and if you touch their gold, they'll come to life and attack! 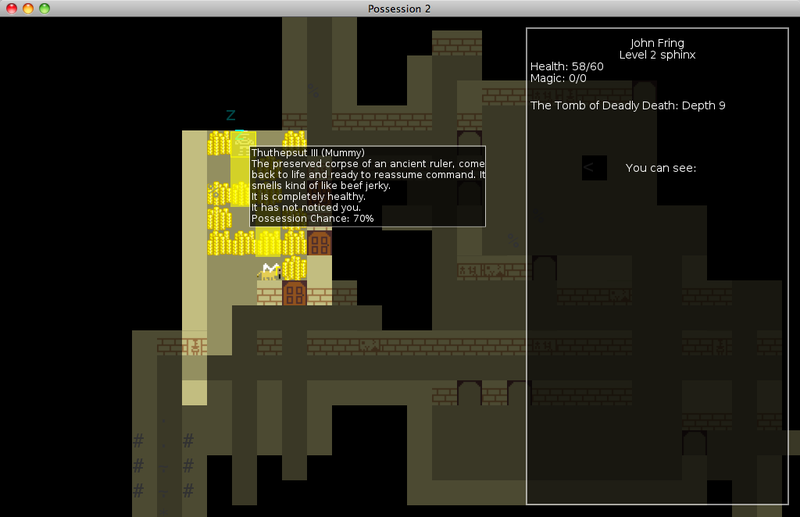 There are also cultists scattered throughout the tombs, who wander until they find a mummy, then begin worshipping it. While the cultists aren't very strong (and the mummies themselves are a bit on the weak side, too), if you're not careful you could find yourself being chased by a mob! There's an upside, though. If you possess a mummy, unaligned cultists may start worshipping and following you instead!